This is how to make your rings stronger. The simplest and easiest way to make your rings stronger is to add a metal band inside, but there are also other ways like grain direction and using the right glue. Put a couple of these into practice and you can make stronger rings. Traditional metal rings have one strong advantage over wooden rings. This advantage is the material itself. Metal is just stronger than wood. That’s a fact. 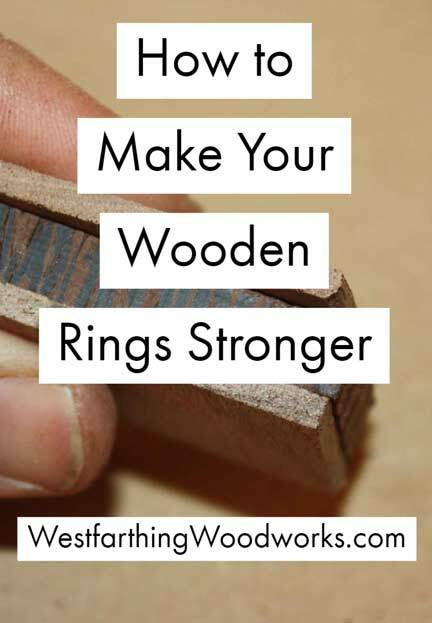 However, there are some things that you can do to make your wooden rings stronger. 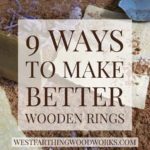 If you start using some or all of these methods, you will make stronger rings that will last longer. There are a ton of different types of wood in the world. If you know nothing about wood in general, you are doing yourself a poor service as a ring maker. 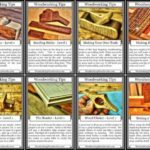 Start with 7 Beautiful Wood Species for Ring Making, and 5 Great Types of Wood for Making Wooden Rings. 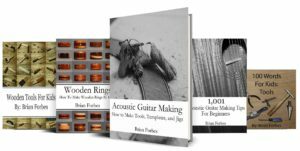 Both of these posts will get you aquatinted with some of the most beautiful wood in the world, and you can get a good start with these pieces. Even with so much available, it’s important to avoid woods that are soft, and weak. Some types of wood are better suited for ring making than others. Other soft woods are too soft, and can break much more easily. Some woods are also so soft that they scratch really easily. You should look for wooden of a medium to dense hardness, and they will make stronger and longer lasting rings. Another thing you can do that was covered in Grain Direction for Stronger Rings is to alternate the grain when you laminate wood. Wood lamination is the process of gluing pieces of wood together to make a bigger blank. This is normally done for beauty, and is how many ring makers create their looks. 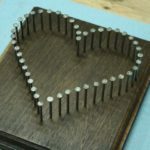 When you glue together a bunch of thin pieces of wood, the way you arrange them makes a difference, and makes the rings stronger. Arrange the blanks so that the grain is running perpendicular to each adjacent piece. If piece one has the grain going up and down, make the next one have the grain going left to right. Keep on repeating this process until your blank is made. I have only made a few of these, so I am still honing my skills. This is why I don’t post a lot about it yet. However, bent wood rings are very strong, even thin examples. Part of this is due to there not being any weak grain areas in the resulting ring. Bent wood rings are made by softening thin strips of wood with water, heat, steam, or a combination of the three. Then, you wrap the piece around something to create the initial bend. After the piece dries, you wrap it around another form about the same size as the final finger opening in the ring, with glue. Finally, after it all dries, you sand and shape the ring. Since the ring is made from several thin layers all wrapped around each other with glue, it’s very strong. Even thin pieces are still really strong, and this is another way to make your rings last longer. 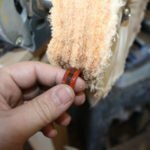 A mistake that is often made is to use poor quality glue or even glue that is not really meant to be used in woodworking for the ring blanks. If you are going through the trouble of laminating wood for a ring, make sure to buy good glue. School glue, rubber cement, and other basic glues are not meant to be used for making ring blanks. Instead, use a strong wood glue with a long track record of success. Look for a name brand, with a long history of being used by woodworkers. My favorite is Titebond. Also, if you are going to use oily woods or materials other than wood, use a good two part epoxy instead of wood glue. A strong epoxy with a name brand that you have heard of before is a good start. For the same reasons as the glue, using a good epoxy makes a difference. For the ultimate in strength, add a metal core to your rings. It’s easy to find a metal ring with a flat profile. All you do is add a wooden layer over the top either by cutting out a piece or wrapping it with bent wood. My Wedding Ring is made with a metal core and Briar wood. I love it, and it was super easy for me to make. The process is similar, and you just work the wood around the metal before you shape it to final size. You can choose the metal for the band, and you can go for something traditional like gold or silver, or you can go inexpensive like steel or titanium. Either way, you will have a nice strong piece of metal inside the ring. When you make a ring with a metal core, you get to take advantage of the properties of both the metal and the wood. You get to see the wood for the beauty as the top layer, but you also have the metal inside for strength. This is a great combination. If you have not been using any sort of techniques to make your rings stronger, then I would like you to start now. 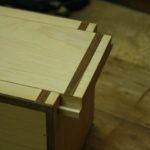 Even if you just improve the wood types that you use and the glue that you use, it will be a huge difference. At least look at the metal rings that are available online. Search on Amazon for “flat wedding band” or “flat ring” and you will see several. Look into the prices, and see what it would take for you to at least get one into the shop to try out. Order a stainless steel ring if you are concerned about the price, and you can get started for a few dollars. Once you make a wooden ring with a metal core, you will end up doing it again because it’s easy and makes a great looking ring. There are a few limitations to a wooden ring that a metal ring does not have to deal with. A traditional ring is made from gold or silver and is a really strong material. Wood is not bad, but it is definitely not as strong as metal. There are some things like grain direction, good glue practices, and correct species choices that will make your rings stronger. Use a few of these and you can start right away making rings that are longer lasting and stronger. Finally, you can even put a metal core inside. If you haven’t done this before you really need to give it a try. 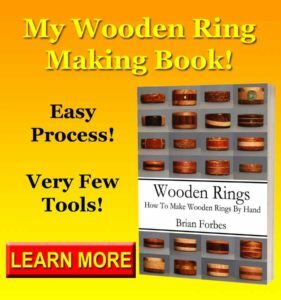 It’s easier than it looks, and if you need step by step directions you can get them in my book, Wooden Rings: How to Make Wooden Rings by Hand.